Chelsea can add more substance to their Premier League title ambitions with a win over Wigan at the DW Stadium on Saturday evening. The Blues are looking to follow-up Monday's eye-catching 2-1 win over Manchester City, with the title-race now 'alive', according to their manager Andre Villas-Boas. His side still trail the league leaders by seven points although, with Arsenal at the Etihad Stadium on Sunday, Chelsea could further close the gap this weekend. Despite their recent victories, Wigan remain in the relegation zone, but a win over Chelsea could end their stay in the bottom three. Defender Antolin Alcaraz is doubtful. The Paraguay international, making his return from suspension, suffered a rib injury in last week's defeat of West Brom and faces a fitness test. 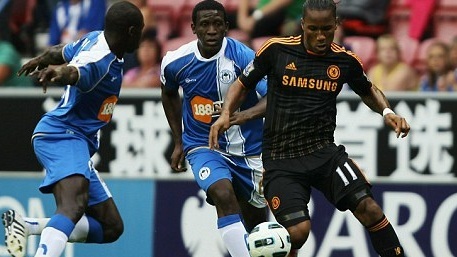 Fellow defender Emmerson Boyce, who has not featured for six weeks, could take his place. Goalkeeper Chris Kirkland is in contention for a place on the bench after recovering from the back problem which cut short his loan at Doncaster. Due to Premier League rules, Wigan are not able to name full-back Patrick van Aanholt in their side as he is not allowed to play against his parent club. David Luiz returns from suspension. The defender sat out Monday night's victory over Manchester City after picking up his fifth domestic booking of the season. Frank Lampard is looking for a Premier League start after scoring the winner as a substitute against Manchester City on Monday, although Raul Meireles is hoping to keep hold of his place. Midfielder Michael Essien continues to miss out, while Josh McEachran cannot play due to the ankle injury he sustained against Liverpool. Jordi Gómez has scored in three of his last four Premier League appearances.